Sai devotee Tapas has sent me few pictures of Sai Prasadalaya at Shirdi . A detail about Parasadalaya is given in Sai Baba Sansthan website which I am giving below for the devotees to read and know about it along with pictures.Thank you Tapas for the pictures. Jai Sai Ram. The very mention of the name Shirdi evokes in the mind of crores of devotees the serenely beautiful, peaceful and pleasant image of Shri Sai Baba and spontaneously the mind prostrates with faith and the hands fold on their own, both, of the believers and non-believers too. The name Shirdi is no more like earlier days. Not merely in the whole of India, the benevolence of Shri Sai Baba on His devotees and His strange Leelas (doings) have spread the fragrance of faith worldwide, which attracts these devotees to Shirdi through various paths and even without those devotees being aware about it . For, the urge of Baba to meet His devotees and the devotees’ urge to meet Baba is uncontrollable. 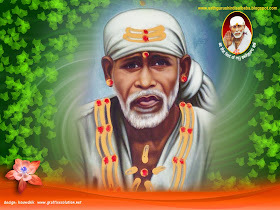 Shirdi is located near Kopargaon in Ahmednagar district. It was earlier known as ‘Shiladhee’ It is now very easy to come to Shirdi. Almost all state government transport buses in India and private passenger vehicles ply continuously to and from Shirdi. Shirdi is about 300 kms. From Mumbai and about 165 kms. from Pune. 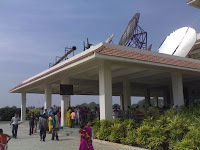 It is convenient to get down at Kopargaon on the Dound-Manmad railway line. Shirdi is 60 kms. from Manmad railway junction. Shirdi is located at a distance of 90 kms. from Ahmednagar and 145 kms. from Aurangabad district places. The black Mother Earth on either side of the road soon-after crossing Nasik draws our attention. During the monsoon days, the black Mother Earth, draped in a shawl filled with splashes of green, pleases the mind and in that blissful state of mind one enters Shirdi. Totally away from any thoroughfare, habitat boundless concern for devotees and the lure for spiritual, divine knowledge and as one sets foot on (Baba’s) Karmabhoomi, in the reign of that knowledge, the mind is over-whelmed with extreme joy, faith and satisfaction. In Kaliyug, charity has an extra-ordinary significance and amongst the charitable duties, offering food (Annadan) is considered supreme. One should regularly do Annadan and satiate the pangs of the hungry. One should do some Annadan to those asking for food. Shri Sai Baba popularly followed (the practise of) Annadan. 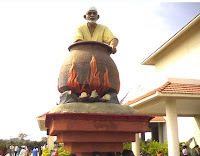 Baba Himself sat to grind the spices and prepare meals. Baba Himself purchased all the ingredients to prepare the meals maintaining perfect account of all requirements. Boiling food in the Handi, He satiated His devotees, poor and destitutes by serving them with His own hands. Truly, how blessed were they who savoured meals prepared by Baba Himself. Shri Sai Baba Sansthan continues this Annadan work perenially through Prasadalaya. Shri Sai Baba Sansthan’s Prasadalaya has become a centre of faith for Sai devotees, who savour the food here with faith as ‘Sai Prasad’ (blessing). If one understands that this is merely not an eating house or a food joint but a ‘Prasadalaya’ then one can know the sentiment of the Sansthan behind this service. The sumptuous meal for merely Rs. 5/- is the special feature of this Prasadalaya. 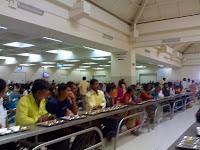 Considering the growing number of devotees coming to Shirdi every day, the Sai Baba Sansthan has erected a Prasadalaya that can accommodate 6000 devotees for Prasad-meals at one time. This has become the largest Prasadalaya among the religious organizations in the country. This single storied grand Prasadalaya on 7 acres of land has been erected at a cost of Rs. 20 crores. In this, a dining hall of 44,567 Sq. ft. has been built. 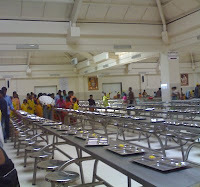 In this 3500 devotees can have Prasad-meals at one time. The flooring of this dining hall is of white refine and dado has been laid and the walls are gypsum plastered. The Prasadalaya has been beautified with tiled roofing. 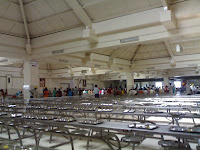 An additional dining hall that cans accommodate 1000 devotees at one time has also been built. And for very important people three dining halls spanning 20240 Sq. ft. have been built, in each of which 300 people can have meals. An Annadan-hall to accommodate 250 Bhikshus (who beg for food) has also been built. A big kitchen worthy of this building has also been built. Ultra-Modern appliances are being used here. Solar system will be used for preparing food. A separate kitchen for preparing Prasad-laddus (sweet) and a hall for drying them has been built. Apart from this, an office for the management and godown facilities has been provided. Rs. 18 crores for equipments and Rs. 2.5 crores for interiors have been spent for constructing this building. This is the biggest and noteworthy project of the managing committee under the leadership of legislator and chairman of the Sansthan Shri Jayant Sasane and vice-chairman Shri Shankararao Kolhe. This Prasadalaya located about one km. from the city to the west of Nagar-Manmad highway and behind Shirdi police station will be very convenient for the devotees. The present Prasadalaya of the Sansthan can accommodate one thousand devotees at one time and daily an average of fifteen to twenty thousand devotees avail the Prasad-meals, informed (ex) executive officer Shri Bhausaheb Wakchaure. Please click on photo's for seeing them in big file size. Om Sai Ram, i and my family wish to get the blessings of Shirdi Baba and we wish to step our foot on Shiirdi soil.Baba Please Bless us to reach in Shirdi soon. Sai Baba's blessing are with me always.